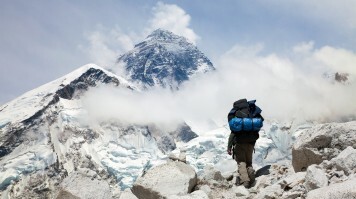 Trek to the Roof of the World, including the Khumbu and Gokyo Valley. On the way to Everest Base Camp, marvel at the incrediblly beautiful sacred lakes. Visit Kalapathar, home to the most incredible view of Mt. See spectacular mountain views from Kalapatar. Cross the world famous pass Chola La at 5420m. The Gokyo Lakes and the Gokyo Ri from where 360 degree of Himalayan Panorama is seen.. The walk across Cho La Pass 5363m..
Everest Base Camp and Kala Patthar. See spectacular mountain views from Kala Patthar. Cross the world famous pass Chola La at 5,420 m.
Climb Gokyo peak for an Amazing view of Nogzumba glacier with Gokyo Lake. Scenic mountain flight From Kathmandu-Lukla-Kathmandu. Great scenery and views of Ice fall and Glacier of Khumbu region. Crossing the glacial Cho La pass at 5,330 m.. Climbing the remote valley trail to Gokyo and its sacred glacial lakes..
“Our experience with Himalayan Leisure could not be any better than it was. Our guide, Dal Bahadur Gurung was highly experienced and knew many details about the landscape that we were travelling through. He told us about the local cultures, history, and mythology of the mountains. Dal was also extremely friendly and became like a brother to us. Most importantly, he was extremely professional and helped provide the best possible experience despite unforeseen weather conditions. During the trip, one of our friends had a family emergency for which we had to arrange an emergency return to NYC from Dingboche. In Lobuche, we were hit with a very strong Blizzard which had us stuck in Gorakshep for multiple nights. Despite these challenges, Dal helped us experience a once in a lifetime experience. 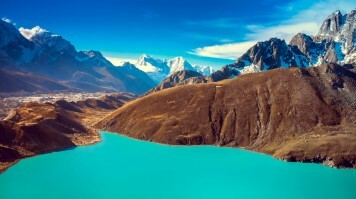 The picturesque Gokyo and Everest Base Camp Trek explores the pristine and beautiful Gokyo region and will later join the famous Everest Base Camp trek via the Cho La Pass, taking you to the foot of the world’s tallest mountain – Mt. Everest (8,848 m). The sparkling and pristine green waters of one of the 5 Gokyo Lakes, near Gokyo Village. If you are looking for a trek with beautiful scenery, great trails, and memorable adventure, the Gokyo and Everest Base Camp trek is for you. The trek includes a visit to the village of Gokyo which is situated next to one of the 5 Emerald lakes which the Gokyo region is famous for. You will also be hiking to Gokyo Ri (5,357 m) which offers one of the most amazing panoramic views of the Himalayan landscape including majestic peaks such as Cho Oyu (8,201 m), Mt. Everest, and Mt. Makalu (8,481 m). After exploring the splendid Gokyo region you will be crossing the Ngozumpa glacier arising from Mt. Cho Oyu. The Ngozumpa Glacier is the longest glacier in Nepal and while it may look daunting and risky, it is not safe to traverse across this massive glacier. You then cross the Cho La Pass (5,368 m) which will take you from the Gokyo region into the Everest region. 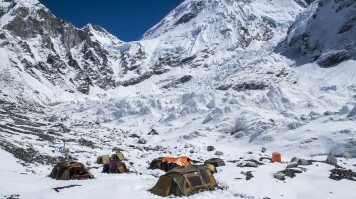 Having entered the Everest region, you will soon arrive at the famous Everest Base Camp with lots of tented camps. Another highlight of the trek is the view from Kala Patthar (5,643 m), the highest point of this trek. Kala Patthar offers breathtaking views of Mt. Everest, the Khumbu Glacier, Nuptse, and other majestic peaks in the Khumbu region. 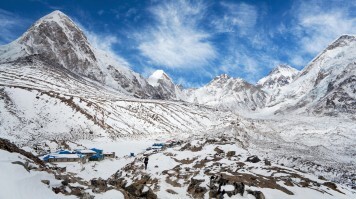 Besides the 15-day Gokyo and Everest Base Camp trek, there are other trekking options available in the Everest region. The standard Everest Base Camp trek is similar to this trek but does not go to Gokyo valley. It can be completed in 12 days. 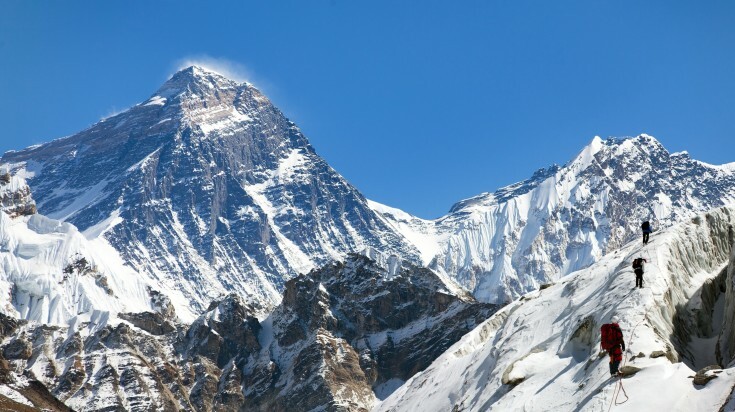 Another option is the Everest Base Camp - 3 Passes trek, which is a 16-23 days trek that goes through three high mountain passes - Kong Ma La, Renjo La and Cho La Pass, each pass above 5,000 meters. 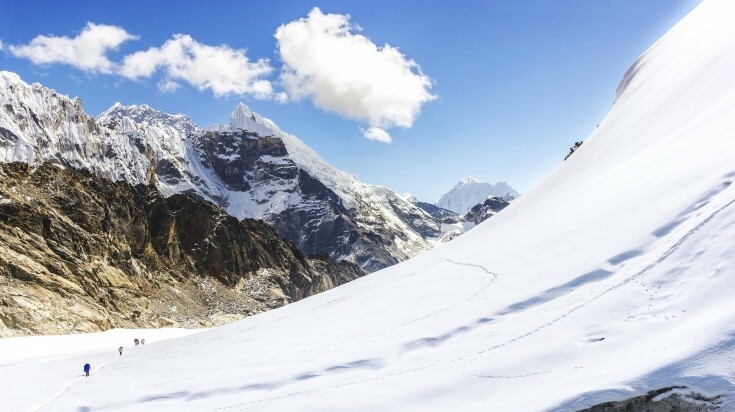 If you have less time on your hands and still want to explore the Everest region, then the 7-day Everest Panorama trek might be your best option. Since this is a high altitude trek that goes through high mountain passes, proper acclimatization is absolutely essential. Acclimatization days are required during the trek to avoid altitude sickness. Temperatures regularly drop below freezing around EBC and Gokyo during early spring, late autumn and winter. Depending on the time of the year, please ensure that you are properly dressed and have the proper gear. Download Trek Guide Enter your email to download a complete guide for the Gokyo and Everest Base Camp trek	.